This series of colour photographs was created on various occasions such as trips to and from regular hanging–out spots and visits to families outside Johannesburg. But in most cases…it is planned “gatherings” with friends as usual, a bit like a young contemporary Malick Sidibé in urban South Africa. His photography integrates documentary and fine art photography practices used to explore and reflect on both the society he grew up in and currently live in as well as on his identity and personal perspective as a young black man living in South Africa. 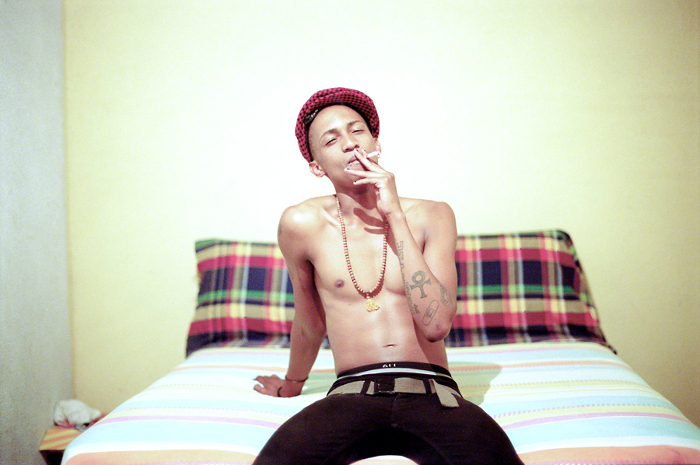 Nxumalo’s images research the identity of this generation that is living in this particular juncture in South Africa, by scrutinising and reflecting the flux of self-defined identities within cultural practices generally not associated with ‘township culture’, such as jazz or kwaito, but instead with alternative practices such as rock music.